As I have written in a previous post, I am about to leave for London where a group of Noh performers from Kyoto and Osaka will perform Noh music and dances at the London Contemporary Music Festival. I am lucky enough to be serving in the ji-utai chorus, and as the day draws near I am getting excited, but also a little nervous about performing Noh in such an unusual context. Even in Japan, Noh is not only performed in Noh theatres: there are a variety of ‘alternative’ stages, such as outdoors stages at shrines or indoors platforms at hotel banquet halls, where Noh is regularly performed. However this time our group will perform in an ex-carpet factory, in front of a mixed audience (the other acts are Stockhausen and Pain Jerk) who might not be familiar with Noh theatre’s conventions, and most importantly our schedule is so tight that will not have much time to familiarise with the local mood (and time zone). How does a group of Noh performers ‘get ready’ for this kind of event? It’s simple, we don’t. ^_^ Noh performers study a shared canon of plays that consist of pre-established choreographies and musical scores, but they do so separately. Movements, lines, drums and flute patterns are the same, but there are various ‘stylistic schools’ for each role. For example, this time Kongō school actors will meet with Morita School flute, Kō School shoulder drum, Kanze School hip drum and Konparu School Taiko. This is one of the many possible combination of schools, and each will perform according to their specific way of interpreting the canon. What is exciting about Noh is that since everyone knows what they are going to play, and what the others are going to play on stage, there is no need for weeks of rehearsals. A brief and even partial run-through, known as mōshiawase, is all you need to check that you are ‘on the same page’ with the others. 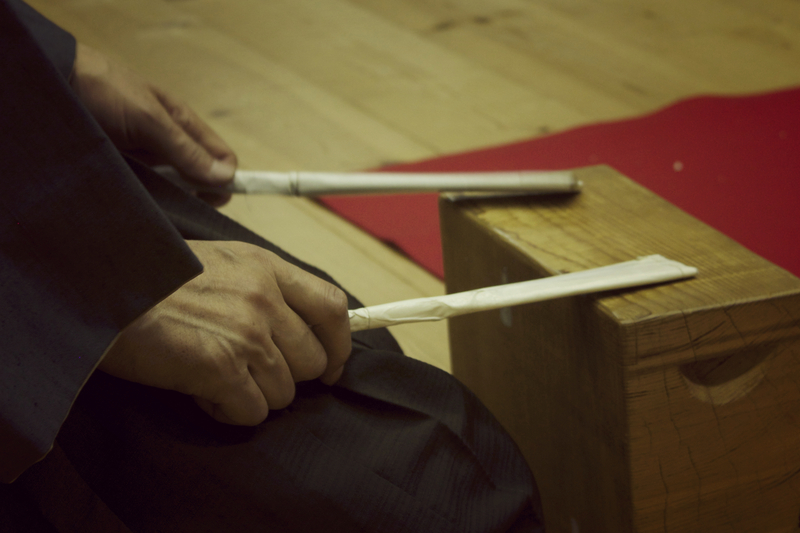 This quality of impromptu is what allows every Noh performance to be unique and fresh, reflecting the Japanese notion of ichi-go, ichi-e, which one could translate as ‘one meeting, one chance’. So when I asked Tatsushige-sensei, who is leading our band, how long would we need to rehearse our programme on the performance day, he replied that we absolutely need to avoid ‘over-rehearsing’, as ‘that wouldn’t be Noh’. So I hope you will make to the London Contemporary Music Festival on May 29th – it’s your one and only chance!